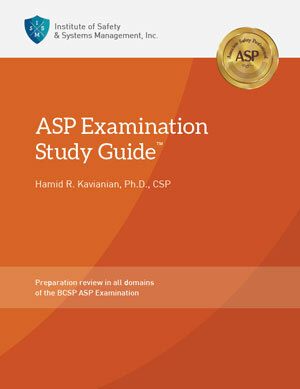 The ASP Examination Study Guide™ textbook which has been distributed by the American Society of Safety Engineers since 1996 has been used successfully by hundreds of candidates to prepare for the BCSP CSP certification exam. New questions have been added in all seven Domains. The Guide prepares candidates in all Domains of the expanded Board of Certified Safety Professionals’ 2015 ASP examination. The new examination is now comprised of seven Domains: Mathematics, Safety Management Systems, Ergonomics, Fire Prevention and Protection, Occupational Health, Environmental Management, and Training, Education, and Communication. The Study Guide includes study sessions and a comprehensive sample exam. Test questions are selected from more than 800 questions in the Guide. All of the Guide’s more than 800 questions have been developed to reflect the type of questions generally found on the examination based on the BCSP’s blueprint for the comprehensive examination. All questions were independently reviewed not only for accuracy, but for level of difficulty and appropriateness as well.